Loneliness has been one of the oldest topics in cinema. This isn’t surprising for an art form that was born out of a century pregnant with the dissolution of the traditional community and whose experience – different from criticism – required a type of attention significantly different from that of fine arts: Strangers sat in a barely lit room and stared into images projected onto a screen affixed on the wall. The further development of cinema into a massive commercial and entertainment space – and the proliferation of home sets – have all significantly transformed the nature of cinema into simply “the movies”; however the relationship between cinema and loneliness has not receded and certain nostalgic trends confirm the privileged place that the origins of cinema and the “modern” condition have in the film industry overall. Cinema has been able to go where the brushes and the daguerreotypes have seldom gone: The intimate spaces of the home, the noise of the highways, and the conversations behind the counters at the banks and supermarkets. It’s not that the arts had no interest in this – for there is no topic more present in modern art than the “everyday” – but that the simultaneity of moving images conferred cinematic realism a new authority. Nuanced portraits of loneliness in full color didn’t appear in the history of art until Impressionism, in the works of Pisarro and Cezanne, but most prominently in the night life scenes of Toulouse-Lautrec; the sad faces quickly disappeared then in the abstract impetus of Expressionism and what followed after, however it was the appearance of cameras what infinitely enlarged the cultural imaginary about the varieties of the human face. When loneliness made a spectacular comeback in 20th century realism – Edward Hopper for example – it wasn’t the natural development of a technique as much as the influx of photographic and cinematic techniques into an art already highly abstract. Silent film evoked this kind of presence, the absolute stare and the modern condition of alienation; it developed a vocabulary that was unavailable to literature, except as a suggestion. Maya Deren writes: “The silent film had attracted to it persons who had talent for and were inspired by the exploration and development of a new and unique form of visual expression.” Silent film remains always the preferred trope for testing the limits of what can be achieved in cinematography. While the technique itself is somewhat outdated, art cinema keeps returning to it not only out of nostalgia but also as a part of cinema’s recognition of itself. That a silent film, “The Artist”, won the Best Picture award at the 2012 Oscars means that probably silent film will return once more at a time when art keeps trying to recognize its own foundations under the increasing pressure of entertainment culture, from which it can hardly be distinguished. Silent films are rare in Middle Eastern contemporary film but some interesting pieces have been released in recent years in different genres. Emirati director Nawaf Al-Janahi explores urban loneliness in his film “Mirrors of Silence” (2006), set in his native Dubai, offering a wholly contemporary stare into the young modernity of the Arabian Gulf; Bahraini director Mohammed Bu Ali explores in his films “Absence” (2008) and “Canary” (2010) the condition of loneliness, in the former with a poetic reference to Qassim Haddad and in the latter with the narrative relationship between a blind girl and a mute man, with a topography bordering on illness; Lebanese director Alain Nasnas explores in “Et si” (2011) the open-ended possibilities of human encounters. It is important to point out that these films are not silent in the traditional sense, for sound is not absent and there might be even conversations, but what is absent is the dialogue – analytical statements overwrite narrative completions. The terminology “silence film” would do more justice to this developing genre in which the innuendos are more often than not suggested rather than implied, and needless to say, all these short films explore loneliness in particular ways. 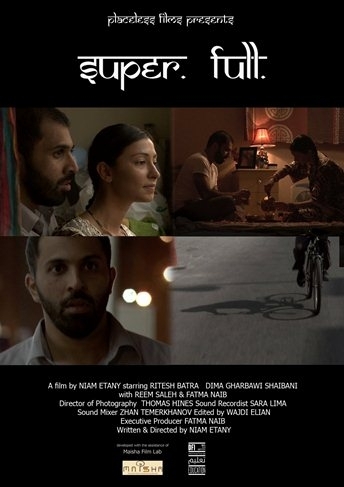 Another addition to this limited but select repertory of short silence films is Lebanese director Niam Itani’s “Super.Full.” (2010) set in Qatar’s opulent capital, Doha, and telling an apparently simple story: A very poor couple of foreign laborers from South Asia struggles to make a living in the rich emirate, far from the commonplace images of Qatar and revolves around the promise of the husband to take his wife to a luxury hotel for her birthday dinner. There would be perhaps nothing exceptional about the story – unless one would view the film for its social realism alone, what is something of an outdated practice – weren’t it for the fact that the couple is hearing-impaired and communicate only through gestures, which is essentially what silent film does. The uncanny development of the story depicts the husband’s plight to deliver an apparently simple promise, under severe difficulties. Hannah Arendt writes: “Promises are the uniquely human way of ordering the future, making it predictable and reliable to the extent that this is humanly possible.” Without the ability to keep our promises, in such an uncertain world, life would be subject to the mercilessness of the biological cycle, and the whole texture of the human world – its durability – would disappear. In this sense, Itani’s film isn’t simply telling a story, but embedded in a highly complex conceptual language, accurately presenting a condition, a human condition. The plight of foreign laborers in the Middle East had remained until recently – particularly in Lebanon and the Arabian Gulf – something of a shameful secret, and though the situation has gained exposure, it is rare to see it presented in the arts, but art has a strange way to come around and approach the topics of the day in forms other than political art and chronic documentary, all of which are being constantly challenged aesthetically and conceptually by more creative re-workings of the present in Middle Eastern documentary and fiction. The film approaches their inability to communicate through spoken language in an unambiguously graceful manner that questions not only the assumptions of the viewer about the underprivileged in our societies, but also the nature of our verbal communication: Is it necessary to speak at all? Are we more or less lonely because we speak? Aesthetically, it also offers a glance into the world of an immigrant couple in the Middle East with their cultural codes, colors and mannerisms, in a way that affords the possibility to see the region – if only for 13 minutes – through eyes other than our own and far from the commonplaces of local cinemas. The film has been screened in different festivals, including 2011 Seattle International Film Festival, and is at the moment shortlisted for YourFilmFestival, an initiative born out of a partnership between YouTube, Emirates and La Biennale di Venezia. “Super.Full.” is the only film participating in the competition, directed by an Arab woman.